Hello Couchers! Welcome to the October 26th edition of Tuesday Couch Potatoes where we post about a movie each week. This week's theme is Life's Gastronomic Pleasures. Food will always be a part of our daily lives. We all love to eat. Nothing is better than watching a movie with the theme centered on food, where the characters show one's passion for the food. As Monsieur Anton puts it, "You should leave the theater so inspired that you want to either sprint straight to a great restaurant or to the kitchen." One such movie is No Reservations, a 2007 American romantic drama starring Catherine Zeta Jones, Aaron Eckhart and Abigail Breslin. This movie is heavily based on the 2001 German film Mostly Martha. I definitely would like to check Mostly Martha out. 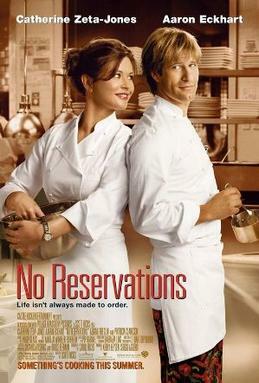 If you still haven't seen No Reservations, you will definitely love this one. Kate (Zeta Jones) is a perfectionist chef addicted to her work struggles to adjust when her sister passes away leaving her with a little girl named Zoe (Breslin) to raise and a new soup-chef Nick (Eckhart) threatens to take over her kitchen with his high-spirited and free-wheeling ways. Here's a preview of the movie. I do hope you enjoyed the preview. Because you know what, "Sometimes, Life isn't made to order". Thanks for joining us this week Couchers! Next week, we are going to feature Scary Movies. Hey, it's November already and what better way to open it than with a movie to scare, right? Till then, take care and Happy TCP! I have seen this movie many time. good pick kikamz.